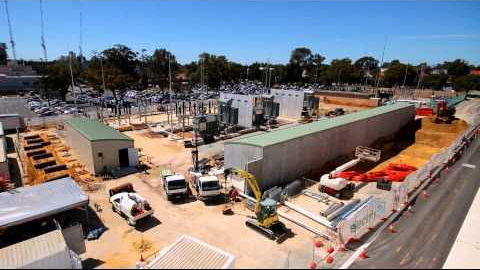 A new 132/11 kV substation was constructed on the existing 66/6/6kV substation site as well as an area of crown reserve adjacent to the existing site. The proposed substation development has an estimated cost of $49 million. The target completion date for the Shenton Park substation expansion is late 2015. The existing 66 kV plant will be decommissioned and removed in 2017. ST Spatial was engaged in the initial stages of the project, right through to the as-built sign off. ST Spatial was responsible for the placement of all concrete footings, pedestals, steelwork and substation components as well as as-constructed surveys of all infrastructure on site.